Fig crostini w/Stilton & honeycomb, originally uploaded by kmcgivney. It's been a while since my Break Your Resolutions party, and I just realized I'd neglected to post the recipe for the most delicious - and most challenging - appetizer at the party. Behold, fig crostini with Stilton cheese, honeycomb, port wine reduction, and honey. I got the idea for this crostini from this recipe, but adapted it heavily - no puff pastry, no walnut crunch, no second baking step. The main thing I used from the original recipe was the cooking technique for the figs, which was fairly straightforward and turned out absolutely delicious. This was the favorite at the party. One guest shouted, "ohmigod, the figs, the figs!" I'd probably tweak it a little next time and use a softer bread, but otherwise it was great - the flavors worked very well together. Bacon chocolate chip cookies, originally uploaded by kmcgivney. The photo has been up for a while. There has been much discussion with friends about the unexpected deliciousness of this cookie. And now, it's time. It's time to discuss this cookie: the chocolate chip and bacon cookie. That's right, I said bacon. I got the idea to make a chocolate chip and bacon cookie after I had the bacon and chocolate bar from Vosges Haut Chocolat. I thought, why can't I do that... in a cookie? So I searched online for a recipe, and heard tales of a restaurant that served a bacon cookie (with chocolate chips, pecans, and cherries, not just chocolate chips), but I only found one recipe, for a cookie that had bacon on top, not inside. So I decided to make my own. I adapted it ever-so-slightly from, you guessed it, a Smitten Kitchen recipe (what can I say? Deb has amazing recipes). Essentially, I sub out really crispy crumbled bacon for nuts in a standard chocolate chip recipe. It's simple, and it tastes delicious! Brownie, originally uploaded by kmcgivney. My husband really loves chocolate. Last week, while we were at Lotusphere, he was very helpful and ran out to get me things and took care of me when I got sick, so I decided to bake him some brownies when we got home as a thank-you. Not just any old brownies, mind you, but these super chocolatey gooey ones with lots of cocoa and big chunks of bittersweet chocolate. I adapted this brownie recipe, but only slightly. I also don't have a round cookie cutter, which makes the brownies look totally amazing, so I tried cutting a few out with a glass. However, they stuck to the inside of the glass, so I ended up just cutting them in regular squares after vowing to go buy a set of cookie cutters posthaste. More photos and recipe after the jump. Pan cookie, originally uploaded by kmcgivney. When I started cooking and baking again, I sometimes found myself lacking the appropriate cookware for the task I was attempting. 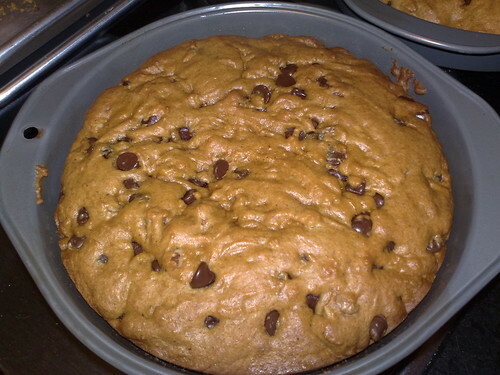 For example, the first time I made cookies in my current kitchen, I didn't have a cookie sheet, so I ended up baking cookies on a pizza stone and in cake pans (with delicious results, I might add). Now that I've taken on cooking and baking as a more serious hobby, I have a lot more cookware and bakeware and fabulous appliances to help me do the job (including my BFF, the red KitchenAid mixer). However, I still sometimes find myself needing to use not-quite-right items in a pinch. Case in point: the other day I wanted to make a pumpkin-y treat, so I decided to make pumpkin chocolate chip cookies. The recipe I had said it made 12 cookies, a measly amount in our house, especially when we are entertaining a houseful of guests, as we were that day. So I did what anyone who loves to feed people might do in that situation and doubled the recipe. Fast forward to forming the dough into cookies on the cookie sheet. We weren't even halfway through the dough and we had already filled two cookie sheets with at least two dozen cookies - far more than what the recipe said. Since the recipe was noted to turn out cookies with a cakelike texture, I figured popping the rest of the dough into cake pans would do the trick - and I was right! We ended up with a little over two dozen regular cookies and two 8" round cake pan cookies. Our houseguests ended up devouring the pan cookies by cutting them into big chunks and eating them with vanilla ice cream, much like one might eat a slice of cake. Yum. Lesson learned? Don't be afraid to use an alternate cooking vessel. The results might just be better than the original. Recipe and another photo after the jump. Butterscotch & ginger cookies, originally uploaded by kmcgivney. As part of my little experiment of returning to the kitchen and cooking at home, I baked some cookies for a friend's birthday recently. I had tried a similar cookie at a local bakery and thought I'd make them, since I really, really like gingerbread and the butterscotch flavor offsets the spiciness of the ginger and clove so well. I baked them a few minutes too long, because after years of not baking I forget that you should take cookies out of the oven when they look not-quite-done so that they stay chewy. They were a little crispier than I would have liked, but they were very tasty. Recipe after the jump. Fusilli with sauteed swiss chard and burrata, originally uploaded by kmcgivney. My husband and I have decided to start cooking more at home. In NYC, where we live, it's easy to get take-out or go out to eat every night - there are literally four good restaurants within one block of our building, and countless good restaurants in our area that deliver. We love food, and after going to Italy for our honeymoon and eating so much incredible food there, we decided that we should learn to cook more of it ourselves. We tried a new recipe tonight - one I got from epicurious and modified - and I'm going to document it here, along with lessons learned and what we'll do differently next time. I hope to have a lot more of these posts going forward! We based our meal around burrata, a fresh Italian cheese made from mozzarella and cream. The outer shell is pure mozzarella and the inside is a mixture of mozzarella and cream. It gives it a lovely soft and creamy texture (similar to ricotta on the inside), and we thought it would be perfect for a pasta topping. For our appetizer, we thinly sliced a baguette, put small dollops of burrata on top, and sprinkled a bit of Italian sea salt on it. It was quite delicious, though next time we will use smaller pieces of burrata and season the baguette slices with a little olive oil and basil and toast them for a crisper crostini. For the entree, we cooked fusilli, boiling it in water seasoned with truffle salt instead of regular salt. While that was cooking, we sauteed some chopped swiss chard leaves in a mixture of equal parts butter and olive oil, seasoned with a little garlic and an herb mix of basil, bay, marjoram, rosemary, sage, and thyme. When the pasta was finished, we strained it and tossed it in a little olive oil. Then we stirred in the swiss chard and mixed it in with the pasta. After we put it on the plate, we topped off the steaming pasta with a healthy dollop of burrata, and sprinkled a little of the herb mixture and sea salt on top. It was also really good, though next time, we'll season the water for the pasta with equal parts regular salt and truffle salt, as the truffle flavor and aroma was a little strong, and we'll only use the burrata in one dish, as it's a lot of creamy, delicious cheese for one sitting. Photo of the appetizer and full recipe after the jump. Update: I tried making the crostini again as a snack, and brushed the bread with olive oil and sprinkled it with a mix of organic Italian herbs, then topped with burrata and a little sea salt again. The results were even tastier and I've added another photo after the jump.